Melville Eastham was born in Oregon City, Oregon, on 26 June 1885 and studied at Portland Academy. He worked for a time as electrician for a street railway company in Portland, and then moved to New York City in 1905 where he worked for the Ovington X-ray Company. In 1906, he joined J. Emory Clapp and W. O. Eddy, two other Ovington employees, in organizing the Clapp, Eddy, and Eastham Company in Boston, Massachusetts. The company became known as Clapp-Eastham following the departure of Eddy, and it manufactured radio equipment. It soon began to sell spark coils, variable capacitors, and other devices to radio amateurs. Clapp sold his interest in the company to O. K. Luscomb in 1910 and he and Eastham moved to a new site in Cambridge, Massachusetts, the same year. In 1915, Eastham left Clapp-Eastham to form the General Radio Company which began with a capitalization of $9,000, and with Eastham and a skilled machinist as the sole employees. 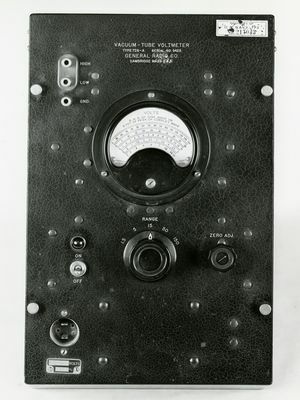 Its first products, as listed in a 1916 catalog, included an absorption wave-meter, a decade resistance box, a variable inductance, and a variable capacitor. The company enjoyed early success resulting from a strong demand for radio equipment for military communication during World War I and from the radio broadcasting boom soon after the war. By the mid 1920's, Eastham had decided to leave the radio transmitter and receiver business to others, and to concentrate on precision instruments for industry and educational institutions. Known as an engineer's company, General Radio became known for the accuracy, durability, and craftsmanship that went into its instruments. New instruments added during the late 1920's and early 1930's included a vacuum-tube voltmeter, an impedance bridge, and an oscilloscope. Eastham also exhibited a great interest in employee benefits and the company initiated a profit sharing bonus plan in 1917 and began to pay the premiums for employee life insurance plans in 1918. In 1919, the company adopted a forty-hour work week and increased the number of paid holidays to nine per year. An employee stock ownership plan was implemented beginning in 1929. Eastham was quite active in the IRE, becoming a Fellow in 1925, and serving as Treasurer from 1927 to 1940. He received the IRE Medal of Honor in 1937 "For his pioneer work in the field of radio measurements, his constructive influence on laboratory practice in communication engineering, and his unfailing support of the aims and ideals of the Institute." During World War II, he was in charge of a successful effort to develop the radio navigation system known as LORAN at the Radiation Laboratory at the Massachusetts Institute of Technology. Eastham stepped down as president of General Radio in 1944 but retained the title of chief engineer until his retirement in 1950. He died on 6 May 1964 at the age of 78. This page was last edited on 4 February 2016, at 20:25.